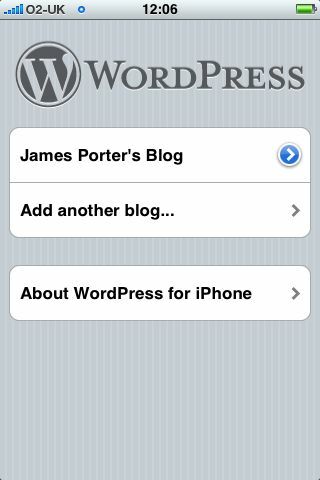 When I ventured to wordpress.com to setup this blog I noticed that there was an iPhone application. As owner of a new iPhone I was pretty chuffed. One of the reasons my previous attempts to blog failed, were lack of time to sit down and write. Although not much has changed regarding time, I can make a good start by creating notes for a post. Another plus for me, when posts are saved on the iPhone it can store them locally, so you don’t even have to be connected. (Very handy in rural Lincolnshire). I knew it was a new application but I really hoped it had comment moderation. Sadly version 1.1 doesn’t but after checking the road map I found that this feature had already been completed. The 1.2 milestone is still in beta and is currently being tested. For me it can’t come soon enough, so if I can make the time I will try and contribute.